Hint: "Be running up that road. 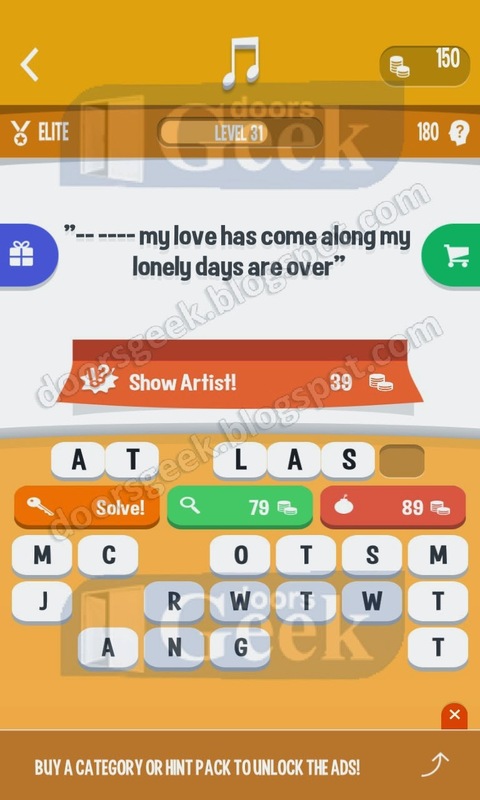 be ------ -- ---- ----"
Song Quiz [Elite] Level 50 Cheats, Solution for Android, iPhone, iPad, iPod. 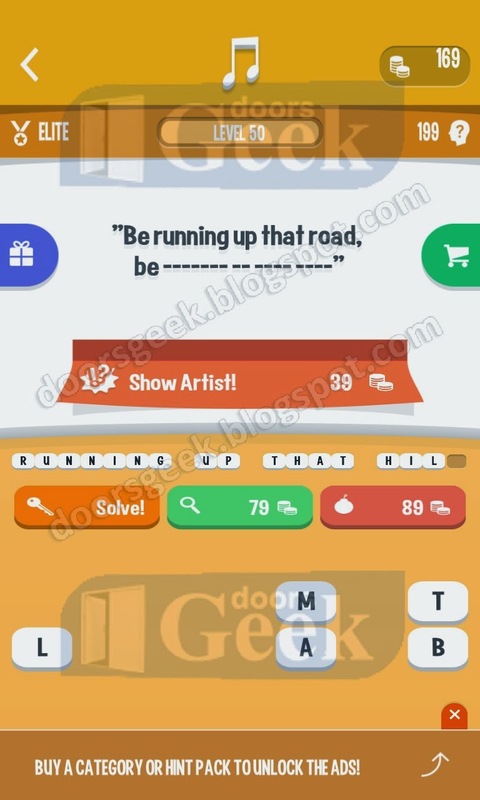 Note: This is "Song Quiz" by "Apprope"
Hint: "Now here you go again. 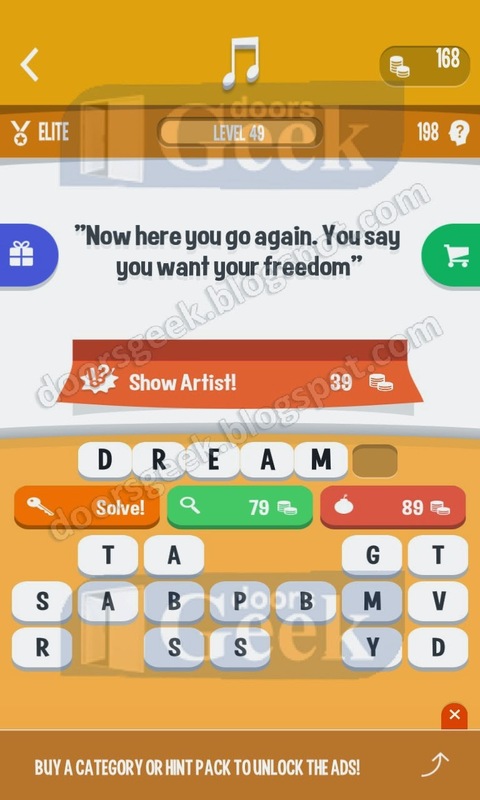 You say you want your freedom"
Song Quiz [Elite] Level 49 Cheats, Solution for Android, iPhone, iPad, iPod. 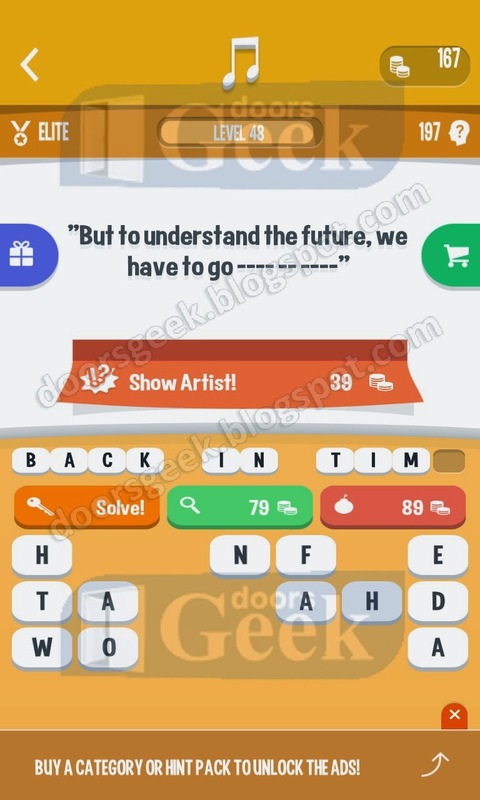 Hint: "But to understand the future, we have to go ---- -- ----"
Song Quiz [Elite] Level 48 Cheats, Solution for Android, iPhone, iPad, iPod. 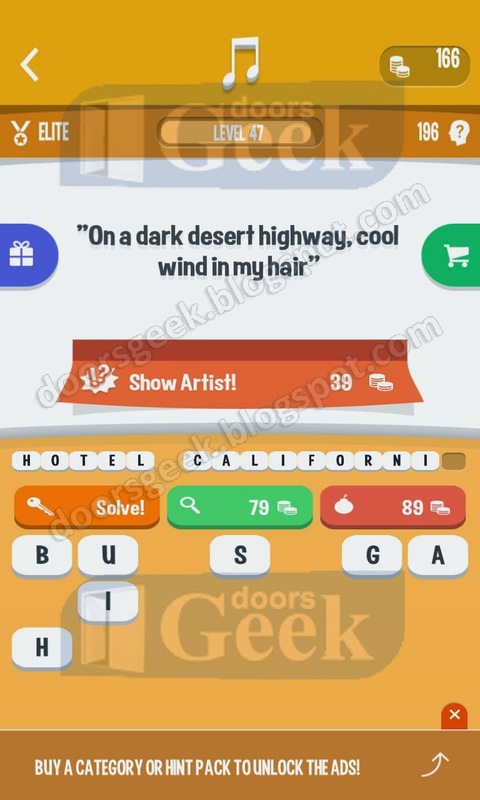 Hint: "On a dark desert highway, cool wind in my hair"
Song Quiz [Elite] Level 47 Cheats, Solution for Android, iPhone, iPad, iPod. 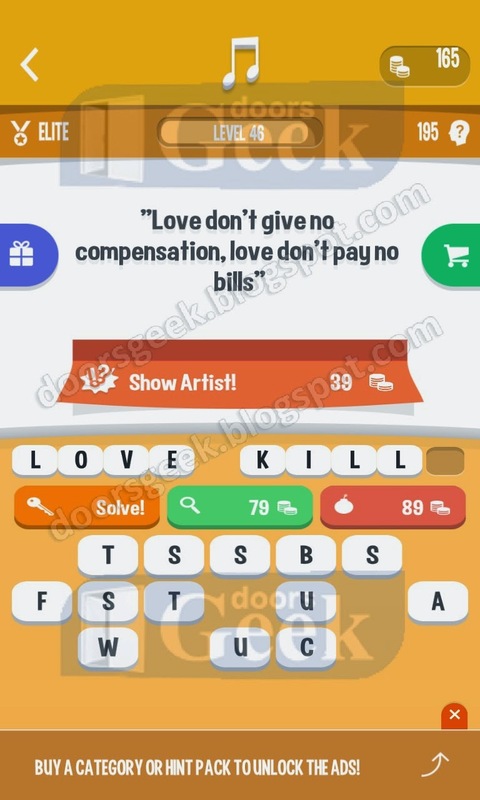 Hint: "Love don't give no compensation, love don't pay no bills"
Song Quiz [Elite] Level 46 Cheats, Solution for Android, iPhone, iPad, iPod. Hint: "At first I was afraid, I was petrified"
Song Quiz [Elite] Level 45 Cheats, Solution for Android, iPhone, iPad, iPod. 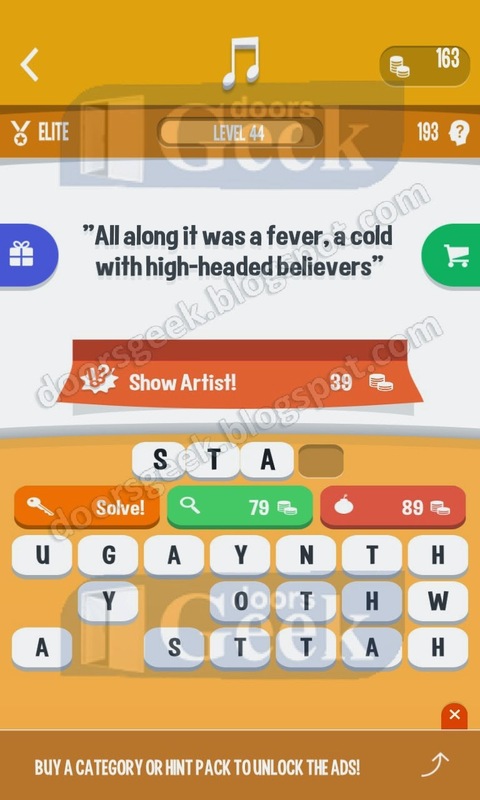 Hint: "All along it was a fever, a cold with high-headed believers"
Song Quiz [Elite] Level 44 Cheats, Solution for Android, iPhone, iPad, iPod. 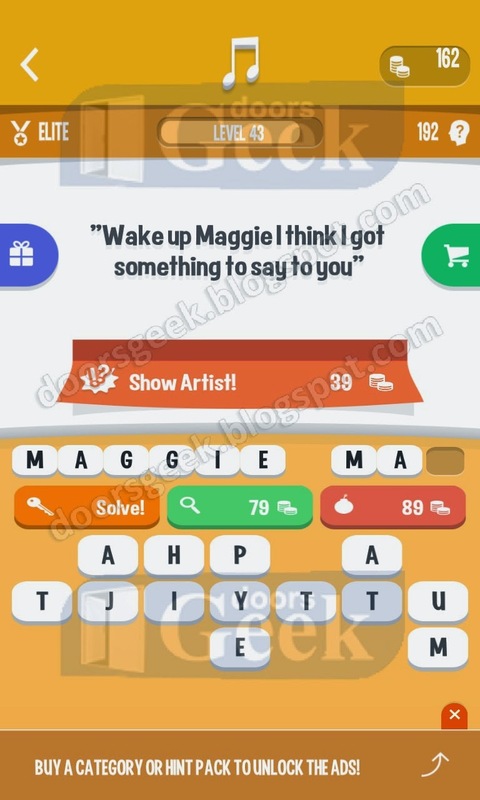 Hint: "Wake up Maggie I think I got something to say to you"
Song Quiz [Elite] Level 43 Cheats, Solution for Android, iPhone, iPad, iPod. 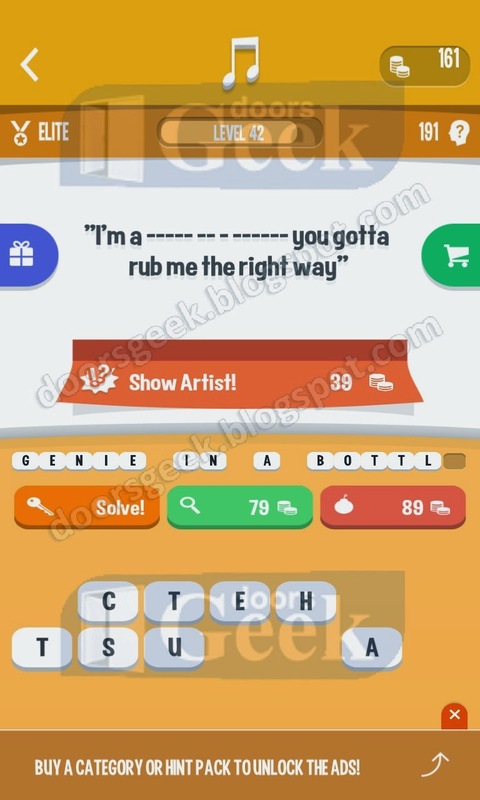 Hint: "I'm a ----- -- - ------ you gotta rub me the right way"
Song Quiz [Elite] Level 42 Cheats, Solution for Android, iPhone, iPad, iPod. Hint: "What goes around comes around"
Song Quiz [Elite] Level 41 Cheats, Solution for Android, iPhone, iPad, iPod. 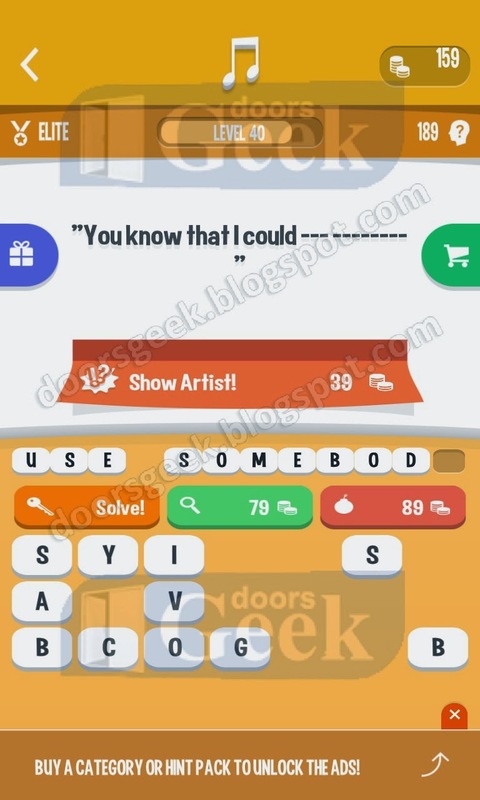 Hint: "You know that I could --- --------"
Song Quiz [Elite] Level 40 Cheats, Solution for Android, iPhone, iPad, iPod. 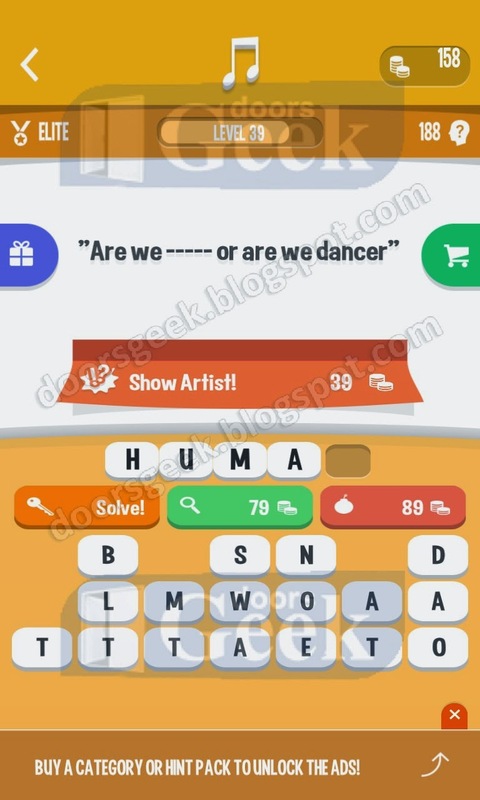 Hint: "Are we ----- or are we dancer"
Song Quiz [Elite] Level 39 Cheats, Solution for Android, iPhone, iPad, iPod. 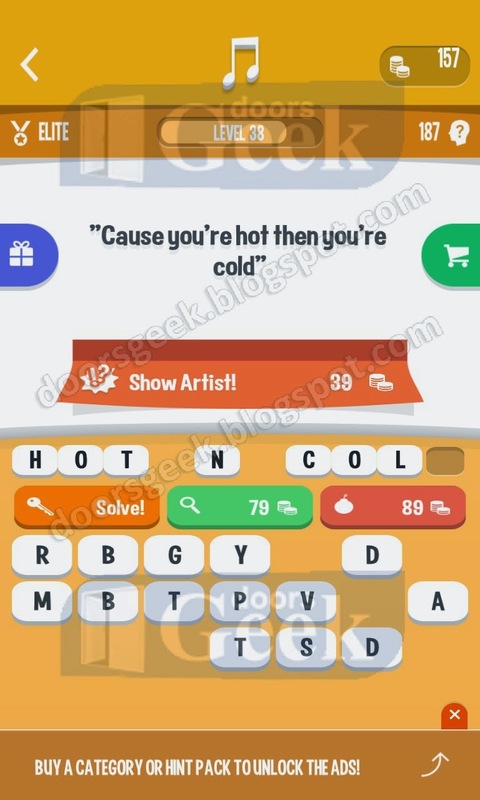 Hint: "Cause you're hot then you're cold"
Song Quiz [Elite] Level 38 Cheats, Solution for Android, iPhone, iPad, iPod. 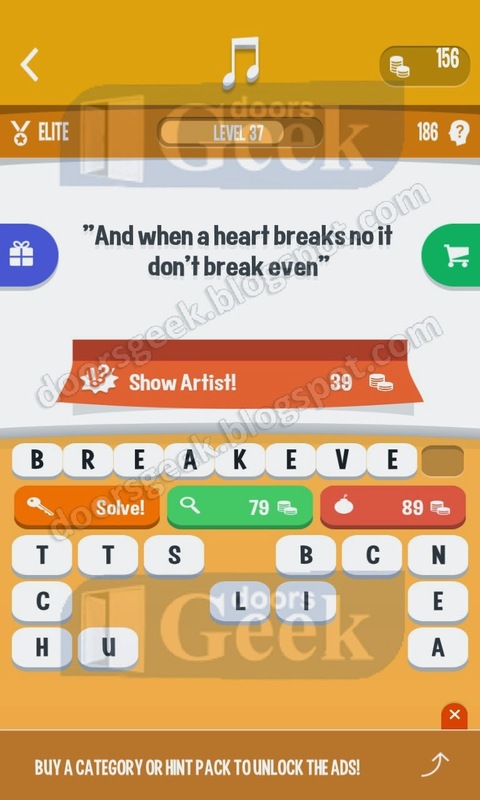 Hint: "And when a heart breaks no it don't break even"
Song Quiz [Elite] Level 37 Cheats, Solution for Android, iPhone, iPad, iPod. Hint: "You ain't tryin' to hide it, girl you're a -----------"
Song Quiz [Elite] Level 36 Cheats, Solution for Android, iPhone, iPad, iPod. 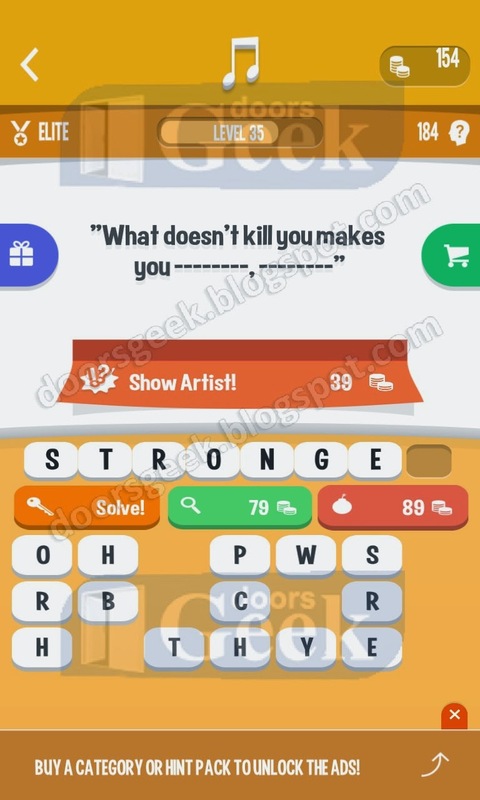 Hint: "What doesn't kill you makes you --------, --------"
Song Quiz [Elite] Level 35 Cheats, Solution for Android, iPhone, iPad, iPod. Hint: "Finally you put my ---- -- ---"
Song Quiz [Elite] Level 34 Cheats, Solution for Android, iPhone, iPad, iPod. 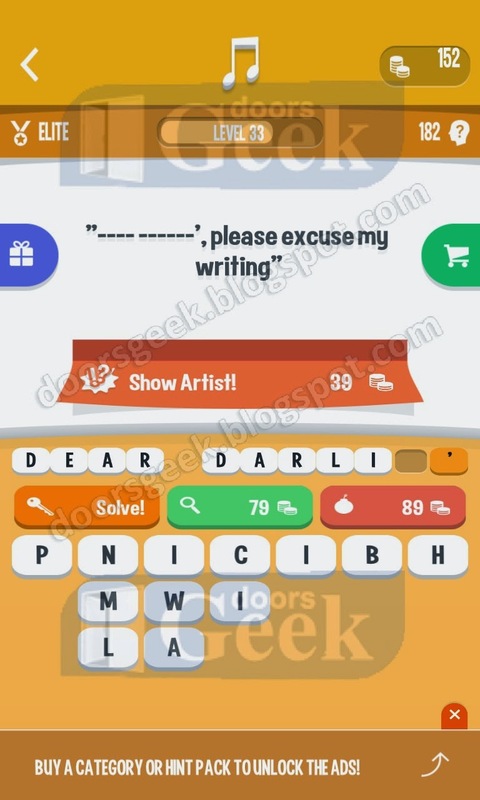 Hint: "---- ------', please excuse my writing"
Song Quiz [Elite] Level 33 Cheats, Solution for Android, iPhone, iPad, iPod. 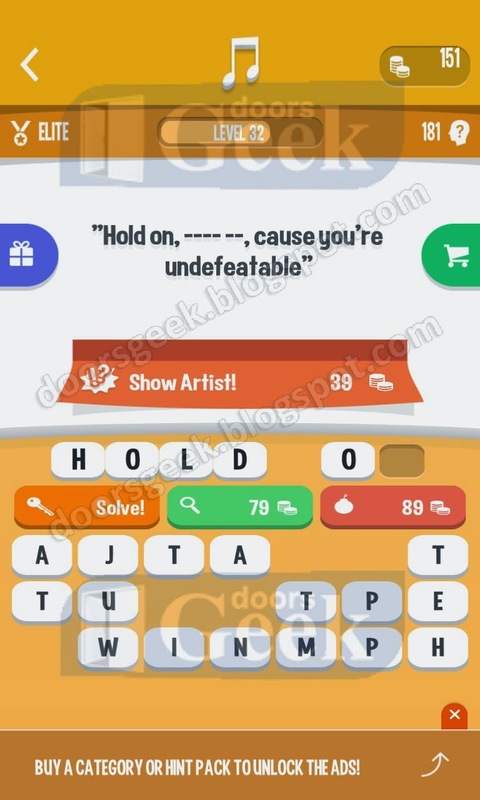 Hint: "Hold on, ---- --, cause you're undefeatable"
Song Quiz [Elite] Level 32 Cheats, Solution for Android, iPhone, iPad, iPod. 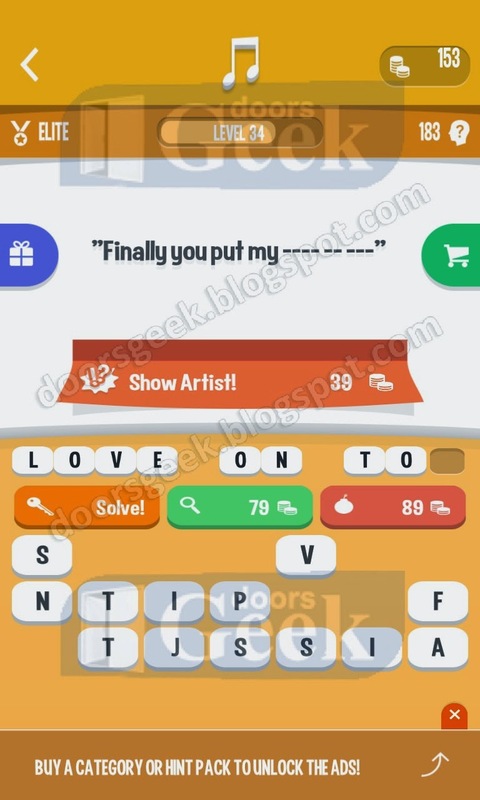 Hint: "-- ---- my love has come along my lonely days are over"
Song Quiz [Elite] Level 31 Cheats, Solution for Android, iPhone, iPad, iPod. 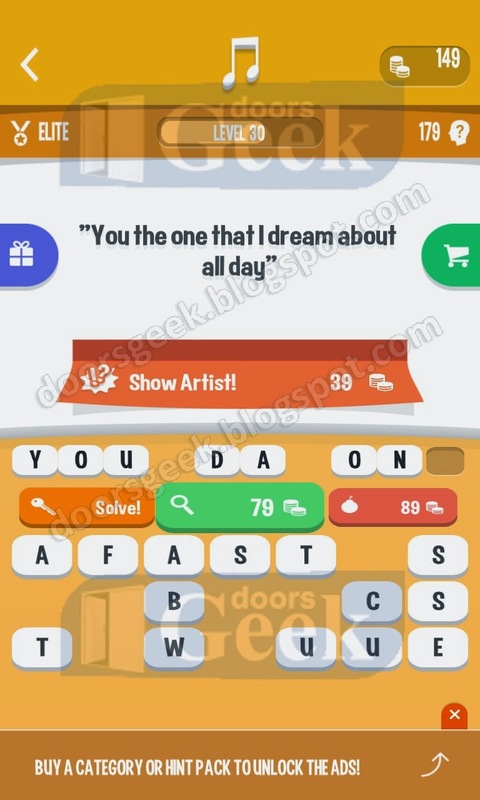 Hint: "You the one that I dream about all day"
Song Quiz [Elite] Level 30 Cheats, Solution for Android, iPhone, iPad, iPod. 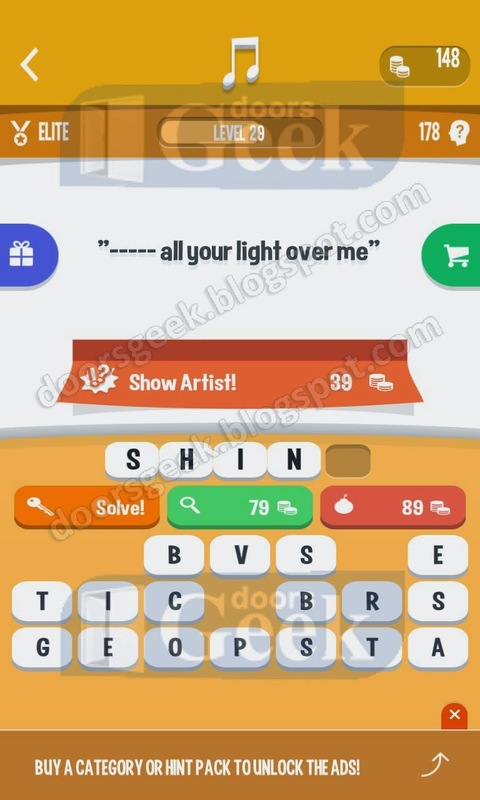 Hint: "----- all you light over me"
Song Quiz [Elite] Level 29 Cheats, Solution for Android, iPhone, iPad, iPod. 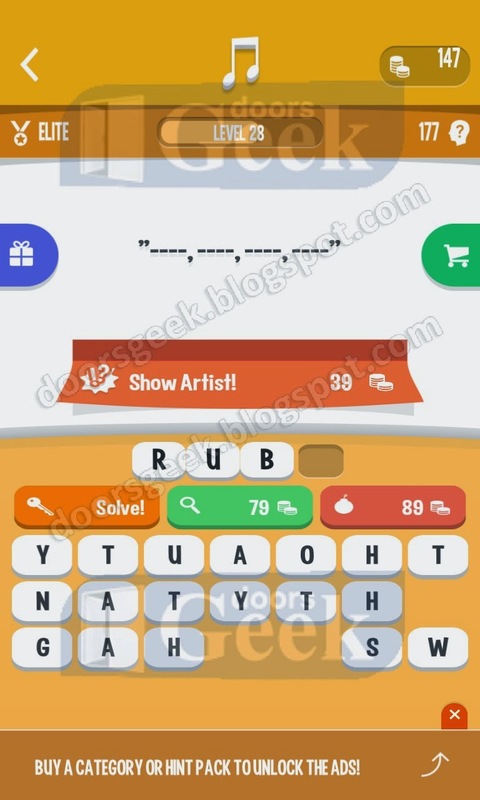 Hint: "----, ----, ----, ----"
Song Quiz [Elite] Level 28 Cheats, Solution for Android, iPhone, iPad, iPod. Hint: "i tried to be like ----- -----"
Song Quiz [Elite] Level 27 Cheats, Solution for Android, iPhone, iPad, iPod. 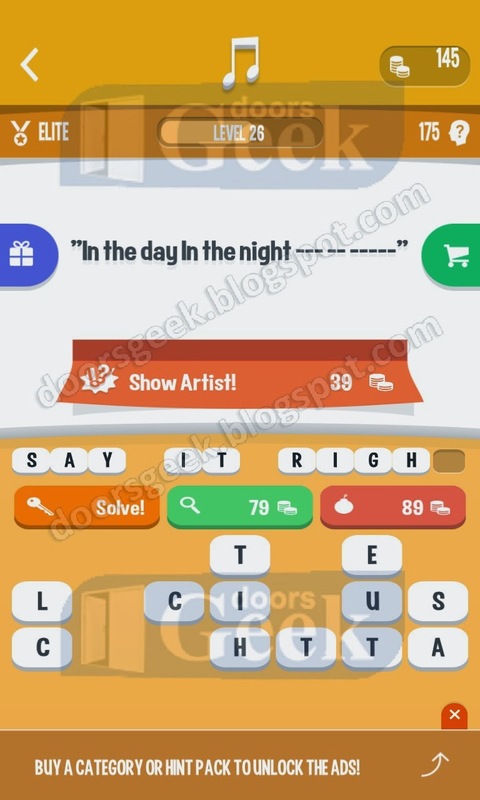 Hint: "In the day in the night --- -- -----"
Song Quiz [Elite] Level 26 Cheats, Solution for Android, iPhone, iPad, iPod. 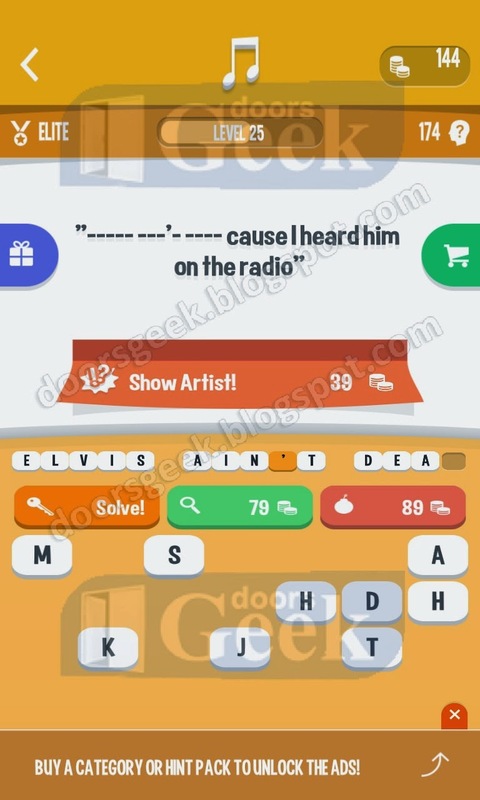 Hint: "----- ---'- ---- cause I heard him on the radio"
Song Quiz [Elite] Level 25 Cheats, Solution for Android, iPhone, iPad, iPod. 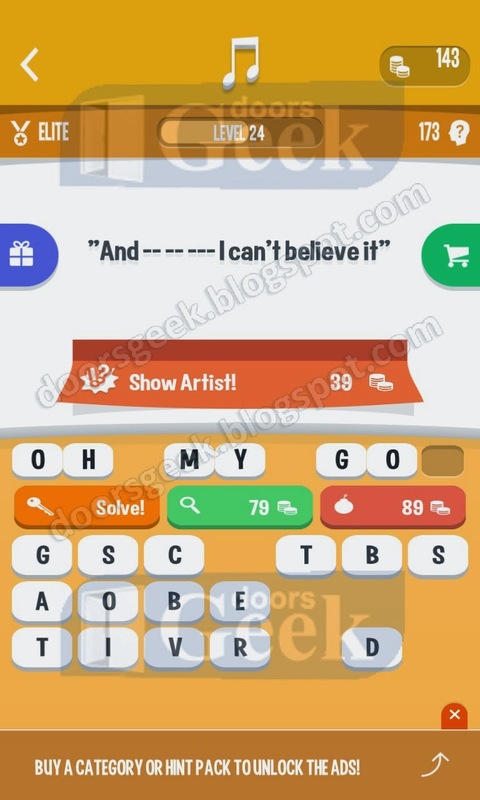 Hint: "And -- -- --- I can't believe it"
Song Quiz [Elite] Level 24 Cheats, Solution for Android, iPhone, iPad, iPod. 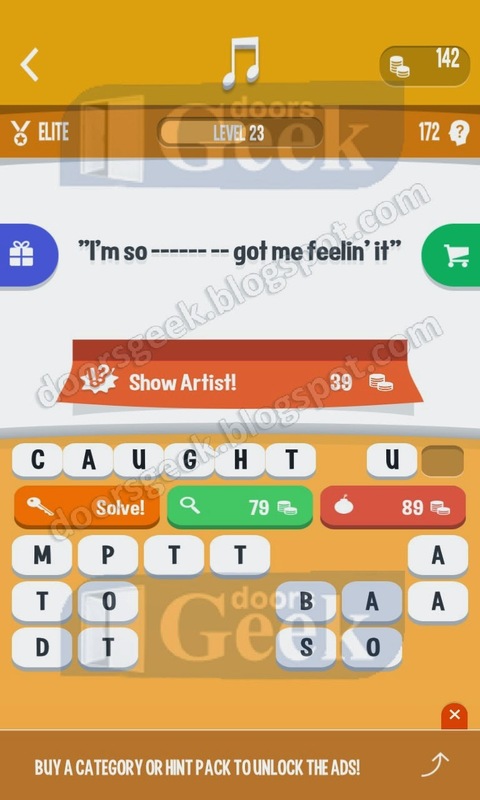 Hint: "I'm so ------ -- got me feelin' it"
Song Quiz [Elite] Level 23 Cheats, Solution for Android, iPhone, iPad, iPod. Hint: "And we gonna let it ----, ----, ----, ----"
Song Quiz [Elite] Level 22 Cheats, Solution for Android, iPhone, iPad, iPod. Hint: "can you hear the drums --------?" 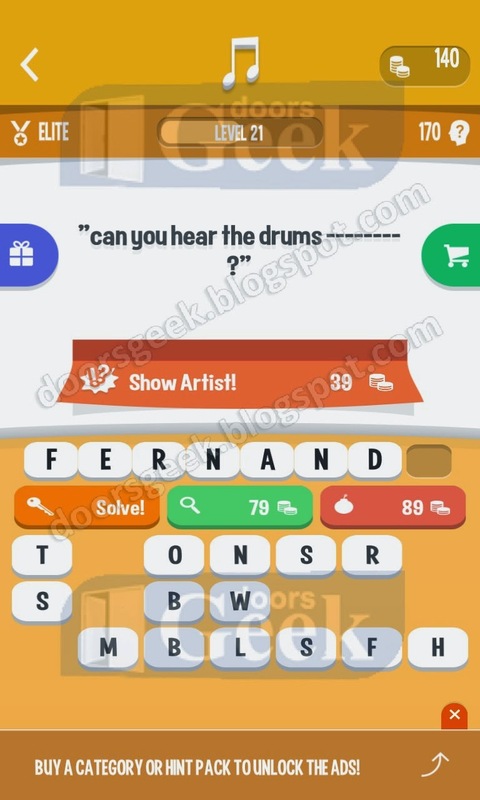 Song Quiz [Elite] Level 21 Cheats, Solution for Android, iPhone, iPad, iPod. Hint: "Feel good, feel good, feel good"
Song Quiz [Elite] Level 20 Cheats, Solution for Android, iPhone, iPad, iPod. Hint: "And birds go flying at the ----- -- -----"
Song Quiz [Elite] Level 19 Cheats, Solution for Android, iPhone, iPad, iPod. 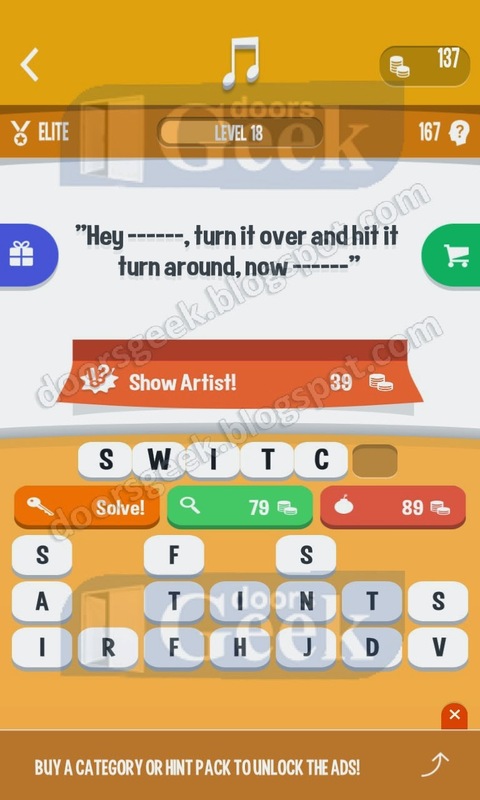 Hint: "Hey ------, turn it over and hit it turn around, now ------"
Song Quiz [Elite] Level 18 Cheats, Solution for Android, iPhone, iPad, iPod. 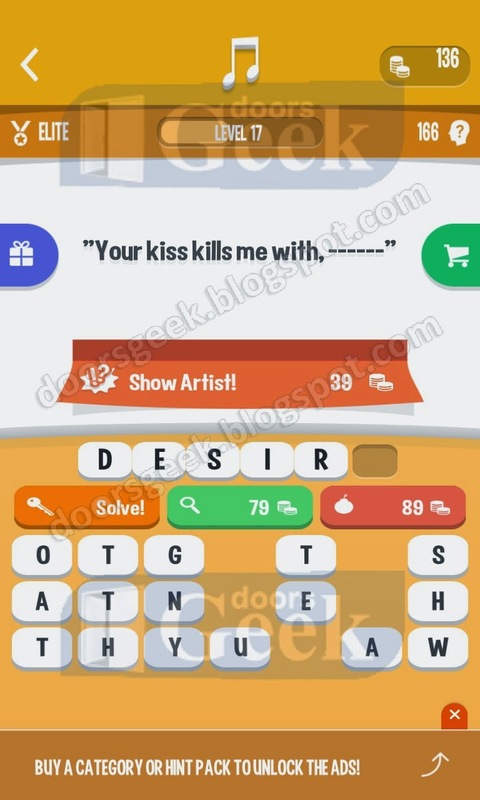 Hint: "Your kiss kills me with, ------"
Song Quiz [Elite] Level 17 Cheats, Solution for Android, iPhone, iPad, iPod. 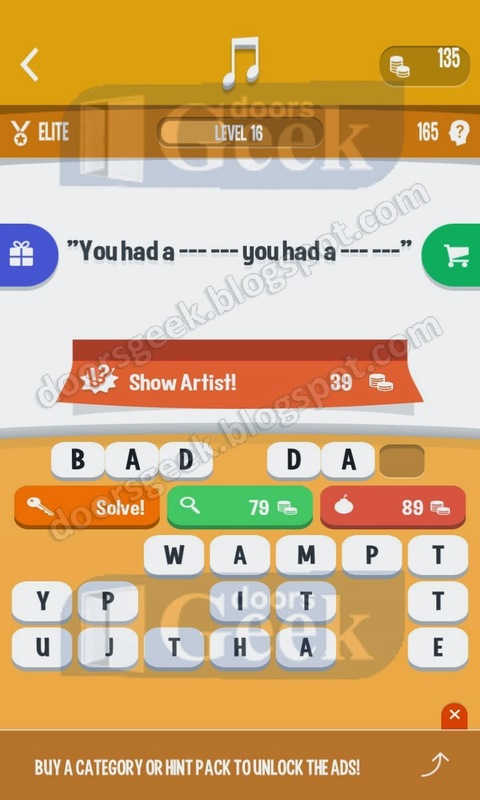 Hint: "You had a --- --- you had a --- ---"
Song Quiz [Elite] Level 16 Cheats, Solution for Android, iPhone, iPad, iPod. Hint: "Come and --- ---- ----- on me"
Song Quiz [Elite] Level 15 Cheats, Solution for Android, iPhone, iPad, iPod. 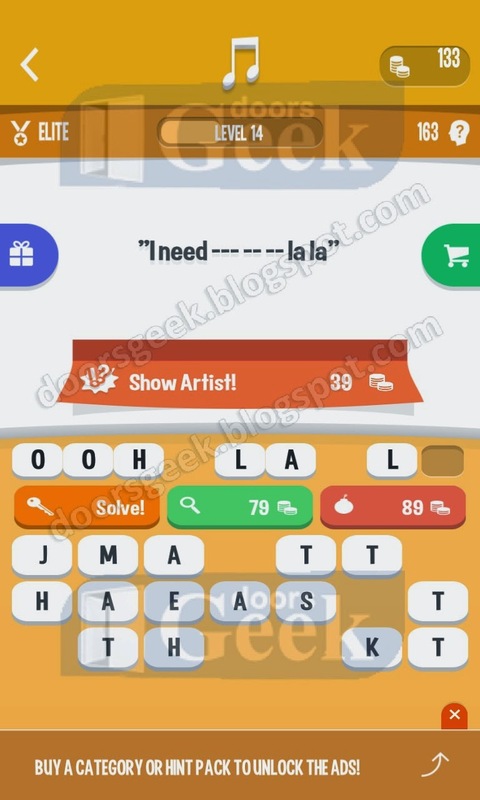 Hint: "I need --- -- -- la la"
Song Quiz [Elite] Level 14 Cheats, Solution for Android, iPhone, iPad, iPod. 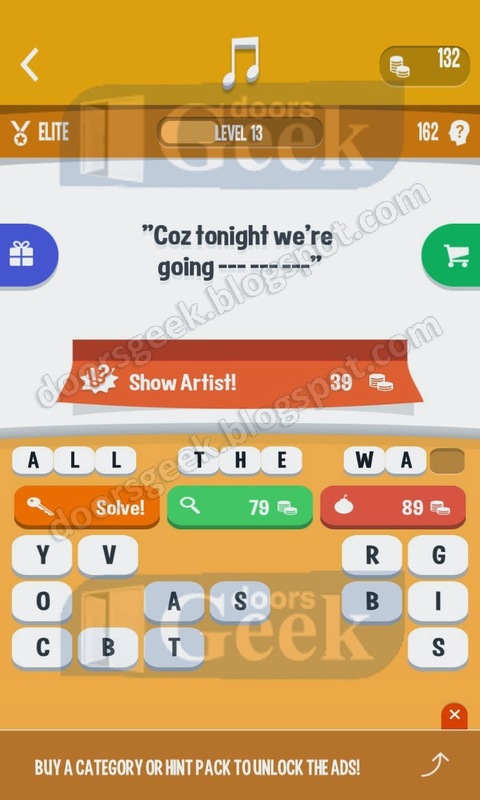 Hint: "Coz tonight we're going --- --- ---"
Song Quiz [Elite] Level 13 Cheats, Solution for Android, iPhone, iPad, iPod. 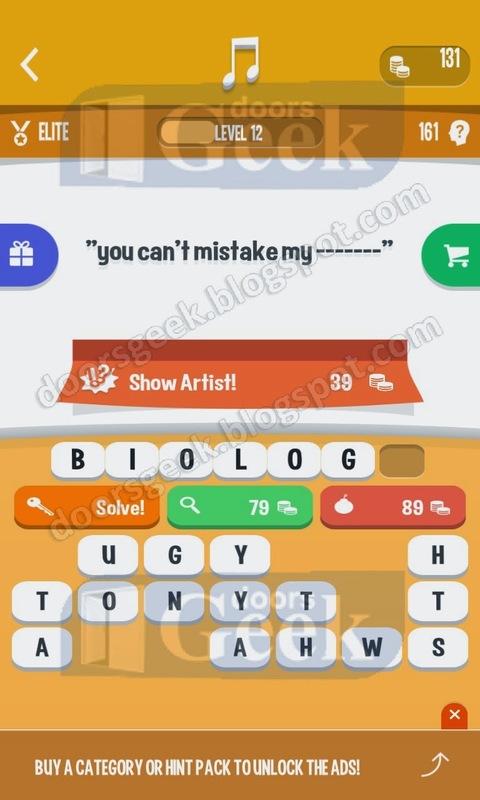 Hint: "you can't mistake my -------"
Song Quiz [Elite] Level 12 Cheats, Solution for Android, iPhone, iPad, iPod. 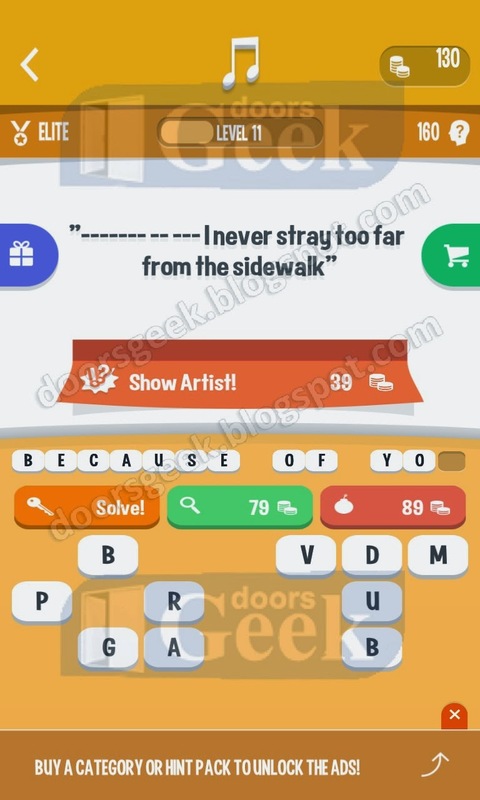 Hint: "------- -- --- I never stray too far from the sidewalk"
Song Quiz [Elite] Level 11 Cheats, Solution for Android, iPhone, iPad, iPod. 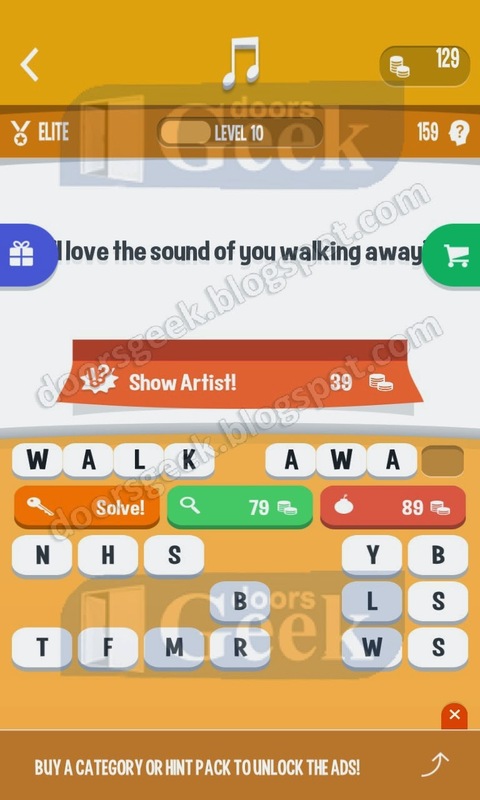 Hint: "I love the sound of you walking away"
Song Quiz [Elite] Level 10 Cheats, Solution for Android, iPhone, iPad, iPod. Hint: "Bought a --- --- ------ to hell and back"
Song Quiz [Elite] Level 9 Cheats, Solution for Android, iPhone, iPad, iPod. 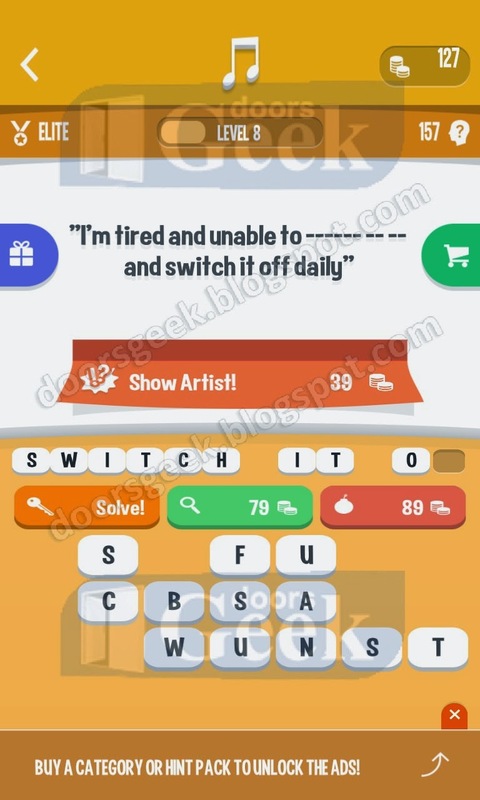 Hint: "I'm tired and unable to ------ -- --"
Song Quiz [Elite] Level 8 Cheats, Solution for Android, iPhone, iPad, iPod. Hint: "Let there be love --- ----- -- ----"
Song Quiz [Elite] Level 7 Cheats, Solution for Android, iPhone, iPad, iPod. 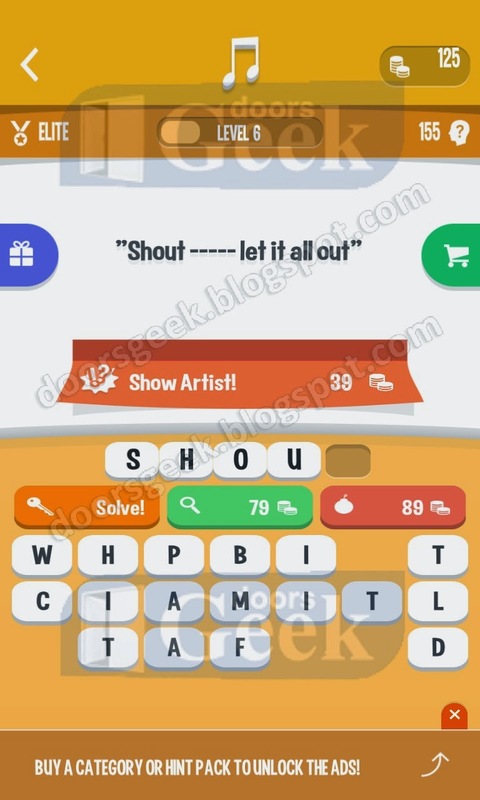 Hint: "Shout ----- let it all out"
Song Quiz [Elite] Level 6 Cheats, Solution for Android, iPhone, iPad, iPod. 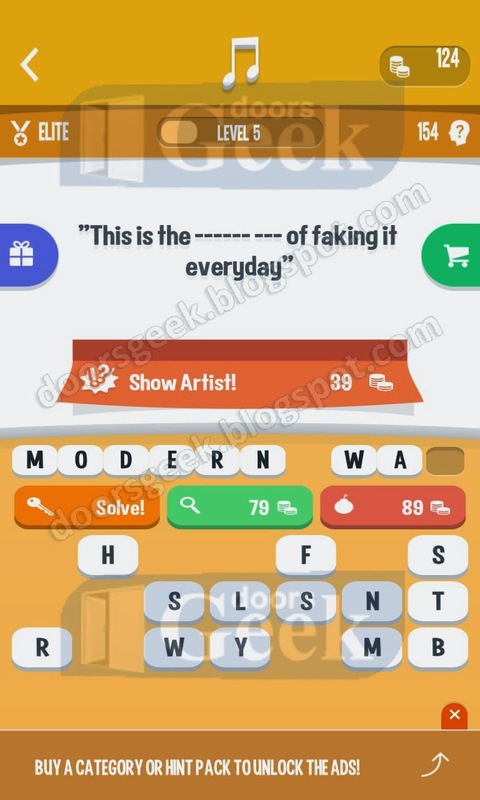 Hint: "This is the ------ --- of faking it everyday"
Song Quiz [Elite] Level 5 Cheats, Solution for Android, iPhone, iPad, iPod. 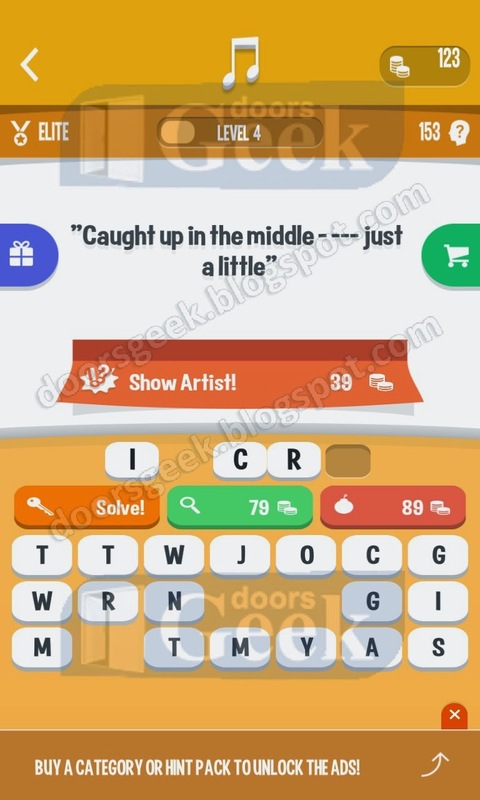 Hint: "Caught up in the middle - --- just a little"
Song Quiz [Elite] Level 4 Cheats, Solution for Android, iPhone, iPad, iPod. 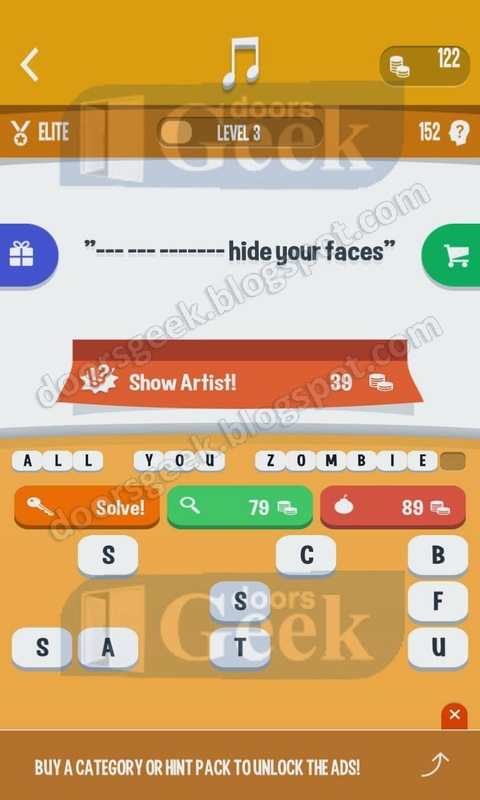 Hint: "--- --- ------- hide your faces"
Song Quiz [Elite] Level 3 Cheats, Solution for Android, iPhone, iPad, iPod. Hint: "--- ----. 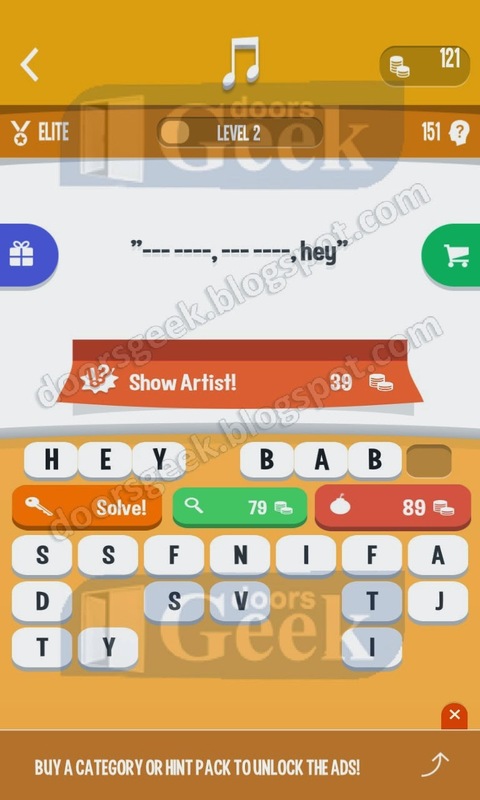 --- ----, hey"
Song Quiz [Elite] Level 2 Cheats, Solution for Android, iPhone, iPad, iPod. 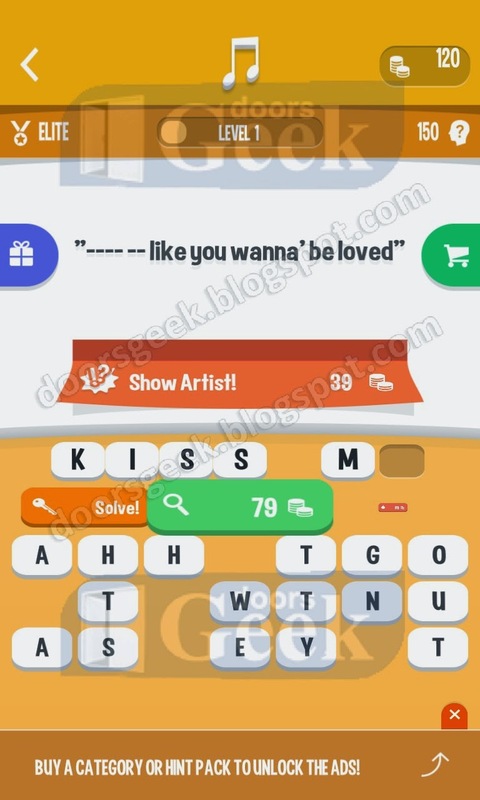 Hint: "---- -- like you wanna 'be loved"
Song Quiz [Elite] Level 1 Cheats, Solution for Android, iPhone, iPad, iPod.